By the way, we’re very happy to let you know that this is just one page out of over 200 we have in our next-generation encyclopedia of obsessively-updated Universal Orlando vacation-planning info. For your convenience, all links on this page will open in a new window. We visit Universal multiple times every month to bring our fans live in-park photo updates direct from Universal Studios Florida, Islands of Adventure, and Volcano Bay! To see all of our photo updates as they happen, we invite you to follow us on Twitter. We also do Facebook live-streaming from in-park as well from our Facebook page and Facebook community page. To be a part of these live streams, like our Facebook page here and join our private Facebook community here. Dive-in movies are back at Universal Orlando’s six on-site hotels! Screening nightly (weather permitting), these allow you to catch a family-friendly flick while hanging out in or around the pool – and the program has been newly expanded, increasing the library of titles the hotels can pull from. 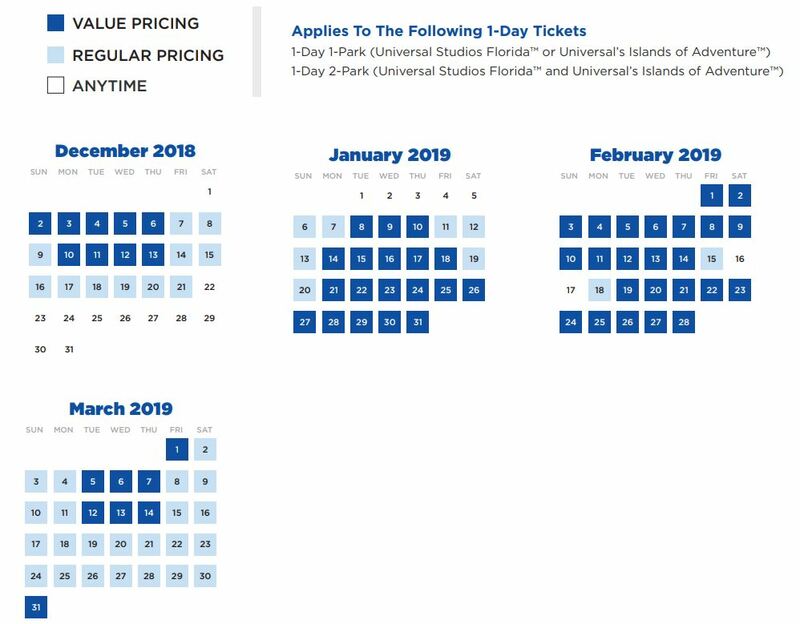 From now until June 12, if you buy a two-park, two-day base ticket (that is to say, only one theme park per day), Universal will give you three days for free! Just keep in mind that you have to use all five days of your pass before December 20 (and that blockout dates are in effect from July 1 through 31). Back in 2016, when the company first switched to a season-based pricing system (in which the time of year and the expected crowd levels determined the cost of a one-day pass), it had initially set up three different levels: Value, Regular, and Anytime Pricing. By the end of that year, however, Universal had decided that it only needed the first two tiers and had dropped the third completely – until now, that is. Universal has been busy replacing and updating the lockers at several of its attractions, including Revenge of the Mummy (which you can read about further on down this page), with part of this process including the addition of larger-size lockers. While the company kept all of these free for guests while they jumped on the corresponding rides, this was changed the first week of December 2018 – now, the larger lockers cost $2. You can check out our lockers page for everything you ever cared to know about the subject. You can find a full rundown on all the numbers and everything else parking-related in our complete guide. On October 4, Universal increased the prices of its various annual passes anywhere from two to seven percent. You can see all the new rates – plus some other changed info for next year, such as blackout dates – in our complete guide to annual passes. Perhaps in a move to help soften the blow, the company is also offering an additional few months to your pass for free. Here are the details: if you purchase a new AP or renew a pre-existing one before April 4, 2019, you get three extra months for the lower two levels (those would be the Seasonal and Power Passes) and an extra six months for the upper two tiers (Preferred and Premier Passes). There’s one important catch, however – you’ll need to also activate your AP (that is to say, use it at the parks’ front gates) before that April 4 deadline, as well. On Friday, February 16, Universal increased the price of admission to its theme parks. A three-day, two-park ticket (meaning you can visit either Universal Studios Florida or Islands of Adventure) went up by 3.6%, to $284.99; a three-day, three-park pass (meaning Volcano Bay is also thrown into the mix) increased by 7.9%, to $339.99. (And just for completeness’s sake, a three-day, one-park-per-day ticket is now $279.99, a 7.7% hike). In the weeks after the theme-park increase, Universal also upped the price of Volcano Bay-only admission – expect to pay $80 now for a one-day ticket, or 19.4% more. The Universal Studios Florida attraction that opens up alongside The Wizarding World of Harry Potter for Early Park Admission is now Despicable Me: Minion Mayhem (at previous times over the past year, it was either Revenge of the Mummy or Fast & Furious – Supercharged). And back over at Volcano Bay, there are now six slides that greet EPA goers. You can find the whole list over at our complete guide to EPA. This Harry Potter-centric annual event, which has been a mainstay at the resort for the past five years, has been cut from this year’s schedule. It’s currently unknown whether this is just a temporary or a permanent move, though we should – of course – find out by the end of 2019. You can relive the past wizarding glories in our complete guide, which we’ll still keep up. After shooting all of its 2018 season at Universal Orlando, the newly-resurrected CNBC show will make its triumphant return this year for its follow-up episodes. No info or dates are available yet, but filming last year started in late July. The first original haunted house of the year has been announced, and it’s the return of a fan-favorite: Nightingales: Blood Pit. Travel back in time to ancient Rome and try to survive the supernatural banshees as they hunt you in the midst of a gladiator game. Read more all about the house in our detailed write-up, and then be sure to scope out the ticket offers that are currently on hand, including the popular buy-one-get-one-free deal from last year, in our complete insider’s guide. April’s Velvet Session will feature Psychedelic Furs. They’ll play starting at 6:30 pm on April 26; you can order tickets here for $39. A VIP ticket is also available for $70, which throws a special viewing area with a private bar into the mix. Meanwhile, Bret Michaels takes the stage on August 2 (for $65 base, $100 VIP, and $125 meet-‘n-greet add-on). And, furthermore, Seth Glier will pull off an acoustic set on May 10 as part of Velvet Unplugged (tickets work a little differently here – standing room costs $10, a cafe-style table for two is $40, and a table for four is $60). You can grab tickets for Michaels here and for Glier here. Not familiar with Hard Rock’s Velvet Sessions? They’re special rock-‘n-roll cocktail parties and lobby concerts held the last Thursday of the month (January through October). A Velvet Sessions ticket includes free specialty drinks, finger foods, and valet parking. Please note Velvet Sessions are for guests aged 21 and older. Also, on Sunday, December 2, 2018, Hard Rock debuted its brand-new weekly Acoustic Brunch in The Kitchen, which has guests enjoying a (what else?) live acoustic performance while feasting on a brunch buffet. There is both a breakfast and salad bar, along with a carving station and salmon platter (among other goodies). The hours are from 10:00 am until 2:00 pm every Sunday, and the price is $38 for adults, $17 for children aged 10 to 14, and $13 for children aged three to nine (adults can add on unlimited Bloody Marys, mimosas, and sangrias for an additional $10). You can view the full menu here. The next Jake’s Beer Festival, which is only held once every six months or so, is scheduled for Friday, May 3, from 6:30 to 9:30 pm, at the Wantilan Pavilion. Approximately 50 craft and specialty beers will be on hand, along with “creative and tasty” foods and, of course, live entertainment. Standard tickets cost $45 and VIP ones are $55; the extra ten dollars gets you access to a secondary area (the Clipper Room in Jake’s American Bar), which brandishes additional beers, “more generous” pours, collectible pint glasses, air-conditioning, and other such perks. You can view the menu here or get tickets here. Please note Jake’s Beer Festival is for guests aged 21 and older. And as of Saturday, July 14, 2018, Royal Pacific Resort now hosts the Despicable Me Character Breakfast. Located in The Tahitian Room (what used to be Emeril’s Tchoup Chop until the end of 2017), guests can enjoy a buffet of “breakfast favorites” and visit with Gru, Margo, Edith, Agnes, and the Minions. One free digital photo is included with the meet-‘n-greet, which costs $34.99 for adults (ages 10 and up) and $20.99 for children (ages three to nine). Neither theme-park admission nor a hotel stay is required; however, reservations must be made at least 24 hours in advance. Each session lasts for an hour, features communal seating (meaning you’ll be making some new human friends alongside the Minion ones), and has three different morning time slots: 8:00, 9:30, and 11:00 (that’s a half-hour later than they initially were). For the first time ever, Sapphire Falls Resort will host a Rum Dinner on Saturday, March 23, which will consist of light hors d’oeuvres, rum samplings, and live entertainment on Amatista Cookhouse’s outdoor terrace before moving inside the restaurant for a “mouth-watering” five-course Caribbean-flavored dinner that is paired with crafted rums from Mount Gay Rum, distilled on the Caribbean island of Barbados. The event starts at 6:30 pm. Tickets are $70 per person, include complimentary self-parking or $5 valet, and can be purchased here. Also, the hotel hosts a Caribbean Carnaval event weekly, where guests can celebrate the culture of various areas of the Caribbean, including the Bahamas, Cuba, Jamaica, Barbados, and Trinidad. We reviewed the event on the Orlando Informer Blog. Please be aware that Caribbean Carnaval now takes place on Fridays (previously, it was Wednesdays). Located at Universal CityWalk, Hard Rock Live is a multi-use performance center that features a variety of acts, from pop and rock artists to stand-up comedians to special events, both public and private. Because Hard Rock Live has dozens of events scheduled at any one time, we aren’t able to list them here – so be sure to check out its website to see if one of your favorite acts will be on-site when you’re there! Today Cafe – prepare to set foot on the set where The Today Show is filmed and chow down on a smorgasbord of delicious food and drink options, including an exclusive coffee blend, pastries, lattes, beer and wine, and a host of other New York-inspired dishes. You can read all about it over on the OI Blog. Hogwarts Express – the iconic train that takes passengers from Diagon Alley to Hogsmeade (and back) will be closed on May 7 for seasonal maintenance. Cinematic Celebration – speaking of annual maintenance, the park’s signature lagoon show won’t be far behind: Cinematic Celebration will be down from April 29 through May 8. Annual passholder’s lounge – from now until December 31, 2019, Universal has a new hang-out spot exclusively for its annual passholders. You can find it in the Hollywood section of Universal Studios Florida, near Schwab’s Pharmacy, and it’ll be open from 11:00 am to 4:00 pm every day. Globus Mundi – the newest store in The Wizarding World of Harry Potter – Diagon Alley opened on October 30, 2018. Our new guide page will make you want to travel the Floo Network straight away! Owl Post – because one brand-new Diagon Alley shop wasn’t enough, Universal went ahead and added twoguide page! This new version of the Owl Post opened on December 7, 2018 and allows guests to mail their Wizarding World purchases back home in gorgeous, customizable packaging. Read all about it on our new . Universal’s Superstar Character Breakfast – this add-on dining option held its final seating on Saturday, November 11, 2017. Replacing it is the Marvel Character Dinner over at Islands of Adventure. Revenge of the Mummy – the ride’s lockers have been moved from their position in front of the show building to within it, where the main entrance had been for the past several years. Many of the props and items that were in this room previously have been removed and are now on sale at Williams of Hollywood, Universal Studios Florida’s prop shop. Terminator 2 3D: Battle across Time – this attraction closed on October 8, 2017 to make way for a new, unannounced show to open in 2019. You can read more about the announcement and history of T23D on the OI Blog. Express additions – Harry Potter and the Escape from Gringotts and the Hogwarts Express now accept Universal Express passes. You can learn more on our Orlando Informer Blog. Race through New York Starring Jimmy Fallon – Twister… Ride It Out closed on November 2, 2015 to make way for Race through New York Starring Jimmy Fallon, which is now open! Details can be found here. Fast & Furious – Supercharged – in a surprise move, Universal announced first thing in the morning on Monday, April 23 that its newest attraction was now open! Find out everything you ever wanted to know about the ride – and leave your real guest review – on our Supercharged page. Disaster! A Major Motion Picture Ride, Starring YOU closed on September 8, 2015 and Beetlejuice Graveyard Revue closed on January 5, 2016 to make way for this new attraction. Learn more. The Wizarding World of Harry Potter – Diagon Alley – Jaws and its home on Amity Island were closed permanently on January 3, 2012 to make way for The Wizarding World of Harry Potter – Diagon Alley, which officially opened on July 8, 2014. This “London” portion of the Harry Potter story features new shops, a themed restaurant, and two new attractions: the Harry Potter and the Escape from Gringotts simulator experience and a real Hogwarts Express running between London and the original Wizarding World of Harry Potter, Hogsmeade, over at Islands of Adventure. Visit our insider’s guide to the Wizarding World to learn so, so much more. The list above is only a summary of the current attraction refurbishments, openings, and closings at Universal Studios Florida. For a complete list of the park’s attractions, scroll to the bottom of this page or visit the OI Universal Center table of contents. Hagrid’s Magical Creatures Motorbike Adventure – the long-awaited new Harry Potter roller coaster has, at last, a name and release date! Expect to plunge into the Forbidden Forest with Hagrid to encounter various rare creatures on June 13, and prepare for your journey by checking out our complete write-up. Dark Arts at Hogwarts Castle – are you ready for a third Wizarding World projection-mapping show in as many years? Good! Universal wants you to take a walk on the dark side with Lord Voldemort and all of his loyal followers, which you can read about in our big article. The Eighth Voyage of Sindbad – Islands of Adventure’s stunt show, which opened with the park on May 28, 1999, staged its last performance on Saturday, September 15, 2018. You can find out the reasons why over on the OI Blog. The Burger Digs – during the week of September 16, Universal started testing a brand-new mobile ordering service, which has since become standard-issue. You can find all the details over on the OI Blog. The Nighttime Lights at Hogwarts Castle – Universal has been continually adding on more dates to its new (more or less) year-round projection-mapping show (which replaced the seasonal Magic of Christmas at Hogwarts Castle at the beginning of the year). Find the full details on our guide page. Marvel Character Dinner – Spidey, Cap, and more are now dinning with a guest of honor – you! We’ve experienced the new Marvel Character Dinner for ourselves, and we tell you all about it in our complete guide. Package pick-up – guests sending their packages to the front of Islands of Adventure to be picked up later now will have to stop by Port Provisions (instead of Ocean Trader Market) to do so. Dragon Challenge – the 18-year-old ride’s final day of operation was on September 4, 2017. A new Harry Potter coaster will replace it, opening in 2019. More details can be found here on the OI Blog. Express additions – Harry Potter and the Forbidden Journey and the Hogwarts Express now accept Universal Express Passes. You can learn more on our Orlando Informer Bbllog. Women’s Boutique in Marvel – a small women’s boutique with Marvel apparel has opened in Marvel Superhero Island. You can see a video of the store on our YouTube channel. The Incredible Hulk Coaster – this headline attraction is now open! It features a new track, completely refreshed queue experience, and more. You can learn all about it by clicking here. Skull Island: Reign of Kong – King Kong is now open at Universal Orlando Resort! This brand-new attraction is located in between Toon Lagoon and Jurassic Park. You’ll navigate perilous jungles, explore ancient temple structures, and encounter hostile natives – and that’s only the beginning. Learn more. The list above is only a summary of the current attraction refurbishments, openings, and closings at Islands of Adventure. For a complete list of the park’s attractions, scroll to the bottom of this page or visit the OI Universal Center table of contents. Tot Tiki Reef – the children’s play area will be closed from March 6 through the 8th for seasonal maintenance. Express Pass changes – there are now two types of Express Passes that are available at Volcano Bay. The basic level covers seven rides (Krakatau Aqua Coaster, Punga Racers, Taniwha Tubes, and the two double-headers of Honu ika Moana and Maku Puihi), while the new premium version adds in four additional attractions (Ko’okiri Body Plunge, Kala and Tai Nui Serpentine Body Slides, and the double Ohyah and Ohno Drop Slides). Pricing depends on the day (such as $50 for basic and $80 for premium, as just one example), and the passes can only be obtained in the park. For more, see our Volcano Bay tickets and Express Pass pages. Character appearance – King Julien from DreamWorks Animation will be on-hand at Volcano Bay to meet-‘n-greet with guests through Labor Day weekend! Ride changes – Taniwha Tubes has now been split up into two different attractions: Tonga of Taniwha Tubes (the green slides) and Raki of Taniwha Tubes (the blue ones). Why make the change? Now, Universal has two different rides where before it only had one, helping to better process the summertime crowds that are already starting to inundate the shores of Volcano Bay. Hours of operation changes – starting in June, Volcano Bay opens at 9:00 am (with EPA at 8:00) and typically closes at either 9:00 or 10:00 pm (though with some exceptions). Weight limit changes – Kala and Tai Nui, two of the three drop-door slides at the park, have had their weight limit changed for the fifth time – they’re now up to 275 pounds after having been down (anywhere from 230 to 270) for a little while. Height changes – more little ones can now enjoy Runamukka Reef, as its height restriction has been bumped down from 54″ to 48″. Menu changes – Volcano Bay has removed over 20 items from the menus across the park. You can read the full details in our article. Now open – the new water theme park is now open! You can see our full coverage here. Bigfire – CityWalk’s newest restaurant, which will replace Emeril’s, has been revealed! Bigfire will cook all of its food on a giant wood-fire grill in the center of the venue, using different types of wood to bring out different smoky flavors. You can get all the details over in the OI Universal Center. Blue Man Group – for the very first time, the Blue Man Group is offering Universal Orlando annual passholders a special showing. On Saturday, May 18, from 8:00 to 11:30 pm, catch a performance of the eclectic group and then stick around for an “exclusive” 30-minute talkback and Q&A, which will cover the Blue Men’s history and behind-the-scenes facts. Tickets are limited and cost $29, plus tax. CityWalk’s movie theater – AMC Universal Cineplex 20 with IMAX shut down on Friday, September 14 and reopened just a few days afterwards as Universal Cinemark, though the process to transition/upgrade each of the theater’s 20 auditoriums will continue on for the next several months. You can read more on our movie theater page. Emeril’s Orlando – CityWalk’s original flagship eatery closed its doors for good on July 7, 2018. Worry not, however – the fine-dining establishment has been memorialized forever in our Prop Graveyard. Voodoo Doughnut – this quirky, delicious West Coast start-up is now officially open! To view its hours of operations, as well as see the rest of our full, in-depth coverage, visit our guide page. Even better, the venue unveiled its Orlando-exclusive flavor on May 31: Universal Orangesicle. Stop by, give it a try, and leave a review on our Voodoo guide page. Looking for CityWalk events? They are included in our events section near the top of the page — skip up there. For more information about Universal CityWalk, scroll to the bottom of this page or visit the OI Universal Center table of contents. Endless Summer Resort – the first half of Universal’s new upcoming hotel complex, Surfside Inn and Suites, just got its opening date bumped up for a second time – guests can now start checking the new resort out on June 27, 2019 (the original date was August). The second half of the complex, Dockside Inn and Suites, is still scheduled for May 2020. You can find out everything you’d ever want to know in our Surfside and Dockside guide pages. Aventura Hotel – Universal Orlando’s sixth on-site hotel opened on Thursday, August 16, 2018, and we have tons of coverage for you to peruse. It all starts on our main overview page! Cabana Bay Beach Resort – 400 new rooms have arrived at Universal’s prime value hotel. The new towers are now open and are located next to Universal’s water theme park, Volcano Bay. Loews Sapphire Falls Resort – Universal Orlando’s fifth on-site hotel is now open! The new property, a paradise where blue waterfalls cascade across lush grounds, features 1,000 guest rooms geared towards families and convention attendees. Our complete guide has been updated, and it consists of 10 pages and hundreds of photos and videos! Loews Royal Pacific Resort – starting in March, portions of Royal Pacific Resort’s lobby will undergo renovations and enhancements. Although this process won’t conclude until October, every service and amenity will continue to be offered. Emeril’s Tchoup Chop closed for good on December 31, 2017, with a “new and exciting” concept slated to replace it sometime in the future. Emeril’s Orlando, meanwhile, remains at Universal CityWalk. “With great gratitude to our loyal customers, hardworking staff, and colleagues at Loews Royal Pacific, it’s been an incredible 15 years,” said Emeril Lagasse. Royal Pacific wrapped up a complete remodel of its rooms. The new rooms are a pretty substantial departure from the previous color scheme and design. Looking for hotel events? They are included in our events section near the top of the page — skip up there. The list above is only a summary of the current projects relating to the Loews on-site hotels at Universal Orlando. For complete details about these properties, including over 700 full-screen photos, check out the links below or visit the OI Universal Center table of contents. When we say that Orlando Informer is the world’s leading resource for Universal Orlando vacation planning, we’re not just blowin’ smoke. Start your journey through our knowledge by following any link below.